Being sick on the road, is probably one of the worst things you’ll ever experience as a truck driver. If you’re doing long haul trucking, you’re literally living on the road in your truck for days, weeks or months at a time. You’ll experience every part of life that you normally would at home, including times when you’re ill.
As if being sick isn’t bad enough, being sick when on the road is even worse. Of course being sick can cover anything from having the flu to needing surgery and everything in between. None of it is pleasant. 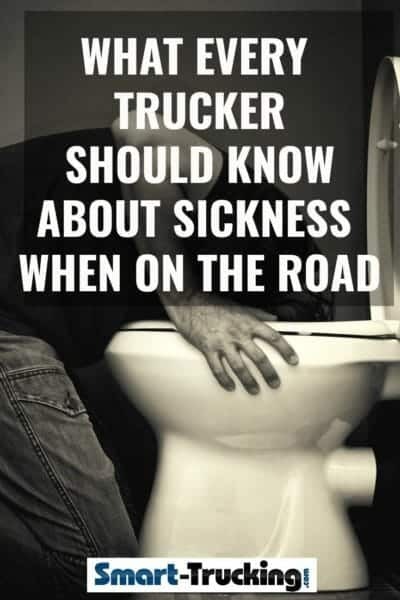 There’s never much discussion about how to handle illness on the road, as a truck driver…. not often mentioned at driver safety meetings either. Rule #1 Find a safe place to stop, preferably a good truck stop. You can’t devote 100% of your concentration to driving if you don’t feel well, so get off the road. You’re a risk on the road…to your own safety and the driving public. Rule #2 Assess the situation. How sick are you? Is this something like a flu bug that will pass after a day or two or is it something more serious? Rule #3 Do you need help? If you think you’ll need help, contact your family and your dispatch immediately. Tell them where you are located and what you think the problem is. Contact truck stop staff and make them aware of your condition. They may need to contact a taxi or an ambulance for you. Rule #4 Remain calm. Panicking and worrying never accomplishes anything. Rule #5 Call 911 if you feel yourself loosing the battle. It’s better to be safe than sorry. Too many drivers have become deathly ill, trying to ride out serious illness in the bunk of their truck. Some have died by not calling for help. Better not to be one of these statistics. Rule #6 Don’t rush your recovery time. I’ve personally made this mistake. If your doctor says stay parked for one week before driving, listen to him. I know it’s tough to loose income sitting and recovering at home, but driving before full recovery can result in disastrous situations, including re-injuring yourself or others, if a loss in driving focus results in an accident. Rule #7 Know your limits and abilities. Park your rig when you need to. You are the best judge of the situation, regarding when you can drive and cannot. Don’t be pushed or intimidated by dispatch because of some ‘hot’ and important load which cannot be late. Rule #8 Keep a ‘drugstore kit’ of common remedies, in case needed. Not a good idea to carry remedies which cause drowsiness or impaired judgement. If you do, make sure you aren’t using them when driving…. it can be easy to get mixed up and take the wrong medicines. When you are sick on the road, you are certainly not at your best for driving a big rig. Park it when necessary. Your decision making impacts on your safety and the safety of others.